… are wonderful things to investigate, especially when those lives are so eloquently reported in such a periodical as Votes for Women. 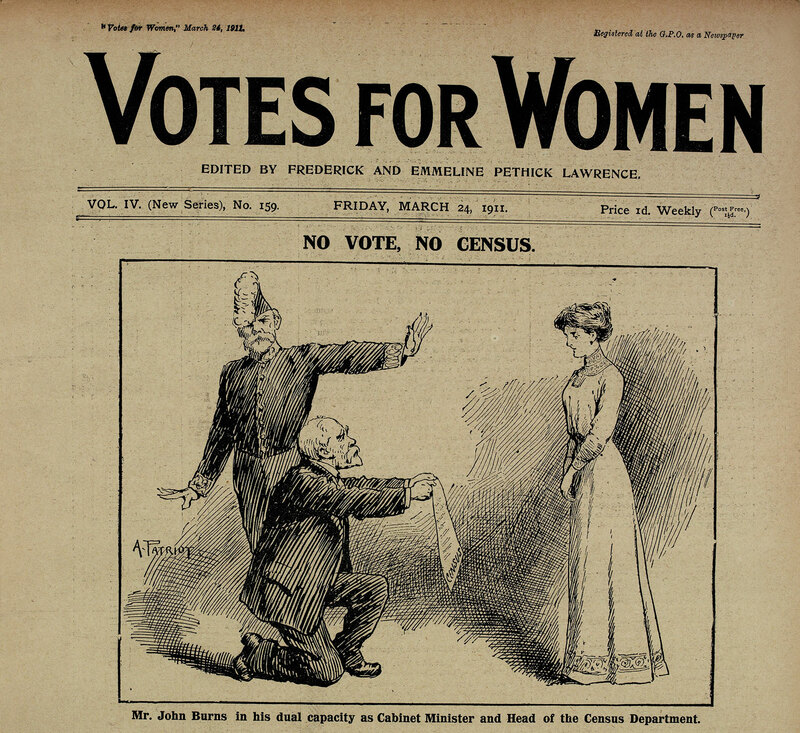 I spent a marvellous few hours absorbed in the minutiae that was the weekly organ of the WSPU, laughing at the satirical cartoons, to rival Gyles, and the witty ‘court reports’ which regaled readers of suffragist exploits in the preceding week. Regular features included protest reports and then follow-ons referring to the arrest and trial of those involved. One such protest, which was carried out on the 21st of November 1911, resulted in 232 arrests – all of which were carefully reported over four pages. The names of those arrested appeared like an honour roll each week … it really brought home what some women endured to give me (and all women) the power to have a say in the way their country is run. It is such a shame that political apathy is so prevalent in young women today; they obviously feel very disconnected from the inequalities and oppression felt by their foremothers. Amongst all of this reportage I found a large announcement referring to another magazine I am working on, which will prove useful in my discussion on rhetoric, as it stands apart, stylistically and tonally, from the rest of the newspaper. I had to transcribe it into type as taking images is not allowed unfortunately – a photocopy would have been wonderful However the binding was badly damaged and several leaves were loose and ragged. It smelt of years gone by and when I first began to turn the pages the dust from it caused me the wheeze a little. After nearly six hours with no break or refreshment I left, having taken copious notes – but plan on returning very soon for another forage. It was inspirational to be able to handle these age-worn editions personally. Often archival material is too fragile to touch (I have to say given the state of these I was surprised to be allowed access) so when you do get to manhandle some it is a very worthwhile experience. The facilities at the NLS are pretty good, although the desks are a little high for typing on a laptop (or maybe the chairs are a little low?) so it can also be uncomfortable when working for long stretches. I am taking a cushion next time. I so agree. There’s nothing better than getting Victoria dust under your finger nails. Somehow handling the original sources gives you a sense of immediacy that you just can’t get from a transcript. As an undergraduate while researching a dissertation into women and law, I was privileged to be able to handle the 1965 charge sheet for Myra Hindley – just knowing that she and I had touched the same piece of paper was awesome. It was that experience that really confirmed my desire to continue with historical research. ‘My’ ladies are a bit sad really, and my next foray into the archives is to find their ‘pleadings’ files. I know that it’s going to be really sad, but I am looking forward to it in a strange kind of way. Your research sounds fascinating. You ladies? Are they of the night – fascinating story reported over 15 years of a Glaswegian Girl named Jessie Brown who was arrested and convicted for soliciting – when she was merely working home from work. She was convicted on the ‘evidence’ of the two arresting officers despite medical experts confirming she was in fact a virgin … it cause an outcry in periodicals such as this. I find this aspect of history so fascinating, and the way in which the advances in psychology did more to oppress women than it did to liberate them. My research is amazingly interesting. Most of the time. I’m looking at the cases of two ‘baby-farmers’ who were responsible for the deaths of many infants between them. I’m mostly looking at the legal framework, the discourse, and the impact that the cases had on the legal system, governmentality, and in particular on the growing tendency for government to intrude in the private sphere – in this case where paid childcare took place in a woman’s home. The women whose cases I’m looking at were struggling to survive. There’s evidence of extreme poverty, drug and alcohol addiction, and the sheer challenge of women surviving independently, particularly in a society struggling to come to terms with the call for suffrage, the Contagious Diseases Act and myriad other issues. Prostitution does interest me (from an academic point of view), and that’s some research I’d like to return to in the future. But, dead babies have my attention at the moment.